Julia was a beautiful baby with a full head of curly black hair. Her first couple of years were filled with sweetness and love, but also many unexplained fevers we chalked up to exposure to her two older brothers, who had persistent asthma, migraines, and, of course, normal frequent childhood illnesses. One morning when I was six months pregnant with her younger brother, she woke up with high fever and a neck swollen as if she had swallowed a whole apple. She was sent for blood work, a CT scan, and eventually a lymph node biopsy. Overwhelmingly relieved she did not have lymphoma, we were not too concerned when her fevers continued, until a few months later when she started with what we had originally thought were night terrors–she would wake up screaming, without explanation. Eventually, she told us her head hurt. Since that day, we have seen dose increases, some more hospital admissions, a switch to canakinumab and the world of the Center for Ambulatory Treatment and Clinical Research is (CAT/CR) for infusions, but also our girl being able to live her life! We have cried happy tears at dance recitals and school performances, birthday parties, and even the day she learned to read. Through it all, her doctors at Children’s Hospital have been there for us with continuous communication, genuine concern, and the determination to help Julia and kids like her. We are so thankful. Through it all, Julia has shown incredible strength and resilience. One time she was admitted to the hospital at age two after a long night in the ER, she snuggled into the bed, looked up at the Red Sox game on TV and asked, “who’s pitching, mom?” That’s our girl. One October when she was admitted with an angry-looking cellulitis of her eyelid, she joked that she would just be a zombie for Halloween! She has somehow always managed to distract herself from the burdens of her life’s challenges and think of herself first as a dancer, a friend, a sister, a hard-working student. She has coped with the difficulties of injections with ritual–in the early years, she would shop with me and carefully choose the band-aids for after her injections. 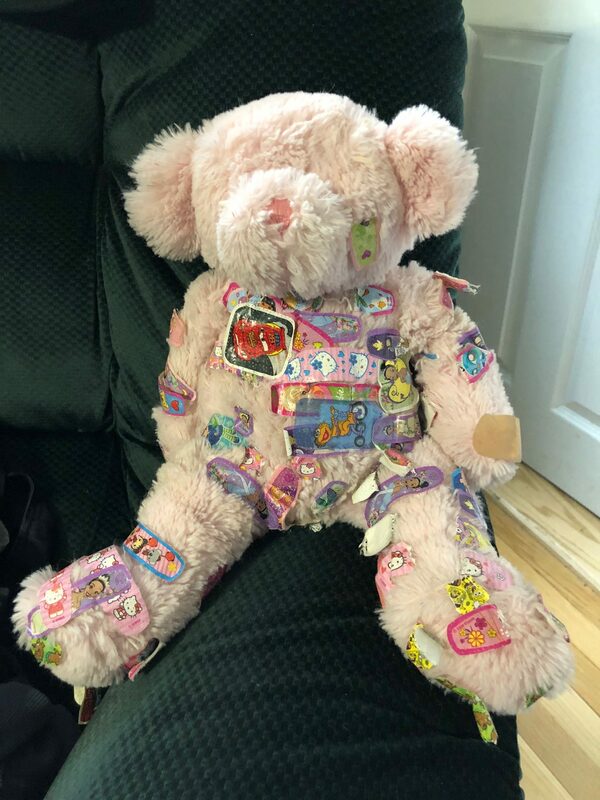 She would give Valentine the bear her shot and band-aid, then allow us to give her her own, although there were many days it was heartbreakingly not without kicking and screaming. Right away, though, Julia saw the connection between the shot and feeling well. These days, she participates in the scheduling of CAT/CR appointments, and her ritual in the CAT/CR is choosing which arm for the shot, and which arm for labs and grabbing a handful of Skittles (minus the green) with each. Even now, I ask her what helps her deal with getting the shot: “it makes me feel better.” She has always been very rational and straightforward. we tell her that she could have a great future in medicine since she is so knowledgeable from her own experience. We were lucky early on in this process to stumble upon the autoinflammatory alliance. Their founder and president Karen Durrant is a mom and nurse who has been a fierce advocate for families with autoinflammatory conditions. They have a phenomenal website with resources for advocacy for dealing with schools, tips for injections, school advocacy/504 plans, also a Facebook community. Julia’s situation has certainly impacted our family, and our perspective. Julia’s brothers are incredibly sensitive young men, and used to instinctively take her blankets to the heater and then to her when she was feeling unwell. Her oldest brother has type 1 diabetes, diagnosed 3 months after Julia began daily anakinra. They would take their morning injections at the same time, and called themselves “the shotters.” We have a skewed perspective on what is truly stressful (only things that are potentially life-threatening), and what is a blessing (a day when all 4 kids are feeling well). We truly seize each “good” day, trying to appreciate and enjoy each healthy moment. Years into this experience, there are still some answers we may not ever have. But overall, Julia is happy; she is able to dance, giggle with friends, go to sleepovers, and fully live her life. She experiences–and indeed spreads–much joy. that is all we can hope for, and all that we are thankful for. Thank you Boston Children’s Hospital!